Jack Burnham and Ryan Pringle showed character as well as skill to take Durham to a six wicket win in an absorbing Division Two match against Derbyshire at Chesterfield. The pair shared an unbroken stand of 124 as Durham chased down a fourth day target of 282 on a turning pitch against Imran Tahir and 16-year-old Hamidullah Qadri. 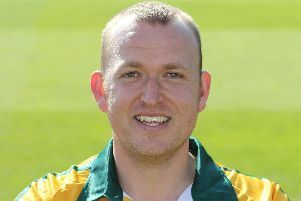 After Michael Richardson scored 62, Burnham made the most of two dropped catches to make an unbeaten 93 while Pringle, who finished the game with a six, ended on 62. It was an impressive display of batting by the pair and Burnham admitted : “That’s cricket, you get your ups and downs and today luck went my way a couple of times but I made the most of it and it was an outstanding win for the boys. Derbyshire had been favourites when the opening pair of Richardson and Cameron Steel walked out with another 246 needed on a pitch that was expected to take increasing turn. Billy Godleman elected to start with his seamers, perhaps hoping for some swing in the steamy heat, but Tahir and Qadri were soon bowling in tandem although there were few alarms for Richardson or Steel. Richardson reached his second 50 of the game when he drove Qadri square for his eighth four but the teenager made the first breakthrough when Steel made room to cut and was caught behind. When Richardson followed three overs later, taken at slip pushing at Tahir, Derbyshire had two ends open but Burnham and Graham Clark, who swung Quadri over midwicket for six, went in at lunch with 137 needed. The pattern of the game had been for wickets to fall in clusters and Derbyshire’s hopes soared at the start of the afternoon thanks to two superb slip catches by Wayne Madsen. Clark edged a drive at Tahir and saw Madsen cling on diving to his right and then Paul Collingwood was taken one handed low down after he was undone by another good piece of bowling by Qadri. At 158 for 4, Derbyshire’s hopes soared but Burnham and Pringle moved through the gears with Burnham hitting three consecutive fours off Qadri before driving Matt Critchley for his second six. Pringle finished it in style by lifting Tahir for a straight six and then driving Critchley for another to leave Derby skipper Billy Godleman admitting: “To have 280 to bowl at on the last day in those conditions I would have taken at the start of the game.